For an on-the-go dish with a chipotle kick, treat yourself to this warm, spicy fajita wrap. Chicken, veggies and pepper Jack cheese? That's a wrap! Cook and stir vegetables in medium nonstick skillet on medium-high heat 4 min. or until crisp-tender; spoon to one side of skillet. Add chicken to other side of skillet; cook 2 min. or until heated through, turning after 1 min. 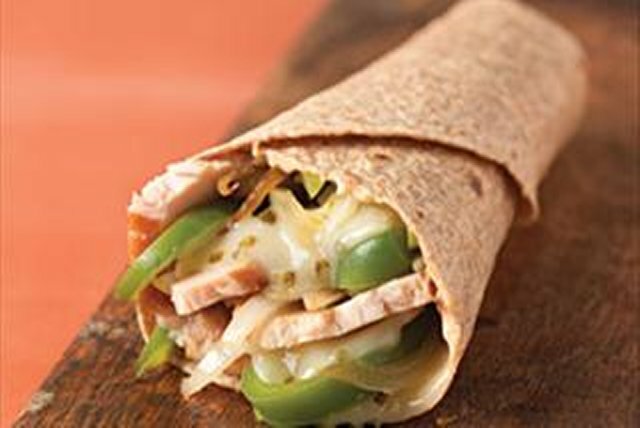 Spread tortilla with aioli; top with chicken, vegetables and cheese. Roll up. Use 1/4 cup KRAFT Shredded Pepper Jack Cheese.